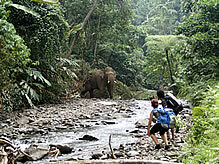 Expedition Jungle | Tailor made expeditions in the rain forests of North Sumatra, Indonesia. Expedition Jungle tours offers you the once in a lifetime opportunity to experience the indigenous wildlife of the North Sumatran rainforest. Gunung Leuser National Park is one of only a few places left in the world, from where you can still see the Sumatran orangutan in the wild as well as a whole host of other wildlife. Gibbons, Elephants, Hornbills, Thomas Leaf monkeys, Macaques and the Sumatran Tiger are just a handful of the thousand animal and plant species unique to this ecosystem. We are a UK and Sumatran based organization seeking to create an example of high standard sustainable tourism within this area. Responsible tourism offers the opportunity to aid the conservation of the environment whilst improving the welfare of local people. Our goal is to provide a high quality of experience for the visitor and maintain the quality of the environment of which both our community and the visitors depend. We create tailor made expeditions and treks to suit everyone from the most adventurous explorer to those wishing for a more gentle introduction to the jungle. Ideal for singles and small groups, budget backpackers or those looking for more luxury. We can cater to the traveller already on the road or those looking for a custom made holiday adventure. Choose from our many tours and expeditions to design your own itinerary. Our highly experienced guides can take you on a trek, from just a few hours or for as long as two weeks. We also organise experiences of the jungle from different perspectives; take an off road trip to visit the Elephants of Tangakhan or enjoy exhilarating white water rafting on the Wampu river. If trekking isn’t your thing, but you would still like to experience the jungle, we can organise for you to stay in a guesthouse with stunning balcony views of the rainforest and some of its inhabitants. You can also take a short walk to a picturesque jungle location near the river to enjoy a delicious barbeque picnic lunch whilst relaxing in the jungle surroundings. Add to this, some overland visits to the volcanoes of Berastagi or the stunning Lake Toba. All tour durations are flexible according to your schedule and budget. We can advise on flights, arrange airport transfers and accommodation for the duration of your stay. Copyright © Expedition Jungle 2017. Website designed by Fay Davey. All rights reserved.